In case you haven’t noticed, open offices have dominated the American workplace recently. In fact, one article from the BBC estimates that about 70% of American workplaces feature an open office concept. With that in mind, you might think it’s a little odd that we’re in the business of selling desk privacy panels and dividers. Here’s the truth: American companies have seriously overplayed their hand when it comes to the open office movement. There’s an assumption that bringing down walls and removing private areas will promote the free flow of ideas. In many ways, the open concept is a reflection of our society in general – the postmodern era not only brought down the rigid walls of modernism, but it also ushered out the popularity of walled cubicles and workspaces. Quoting a study by design firm Gensler, the BBC noted that “more than two-thirds of US employees are unhappy with noise levels at work. “Already, workplace performance has dropped 6% since 2008, driven largely by the inability to focus,” the article read. While the productivity decrease may have more to do with the onset of social media and fantasy sports, we do know that the overhaul of traditional workspaces doesn’t seem to be providing the results most offices hoped for. History is like a pendulum swinging back and forth. For a time, the pendulum of office design was madly charging away from walls and toward an open concept. That trend reached its apex around 2014 and 2015, and while it’s still the darling of office design, the pendulum is starting to swing the other way. Take Microsoft, for example. In a 2015 article from the BBC, Pankaj Arora, a member of Microsoft’s Modern IT Innovation Group, said that there’s no question a private workspace increases productivity. Before his team launched, they talked about the kind of office they wanted. They pondered the open concept but eventually decided against it. Their solution was an elegant one. All cubicles had high walls to deaden sound and create privacy. 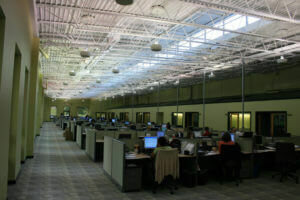 Their office was a rectangle shape with cubicles lined up on the long sides of the rectangle, facing the wall. There’s a big reason why the open office concept hasn’t led to more productivity – humans crave a certain level of privacy. Psychologically speaking, having your own space gives your mind the spatial security it needs to think freely, be creative and focus on the task at hand. Divider panels provide that space. What’s great about them in relation to the modern area of office spaces is that our desk-mounted panels can literally turn an open office space into a semi-private work area overnight. Installing divider panels onto desks requires basic hardware and about 10-15 minutes. Businesses don’t have to worry about shutting down office operations or moving equipment out and back into their workspace. In many cases, our desk divider panels can be installed while people are working. It’s not just about ease, though. The sound and visual privacy our divider panels provide give your employees the autonomy they crave and, as a result, their productivity will go up. Not only do our divider panels attach to desks that don’t currently have any walls or floor dividers, but they also easily attach to existing walls between cubicles. Stop by our Products page and take a look at the various options we provide.